Penn State graduate and documentary filmmaker Kelly Dolak is on a mission. In the aftermath of the now-infamous Jerry Sandusky scandal that erupted in November, Dolak started making regular trips to the State College area. After the charges against Sandusky were announced and the Penn State Board of Trustees removed university president Graham Spanier and football coach Joe Paterno from their posts, some of the students rioted in the streets. Although this was not representative of the student body at large, images from the riot have been replayed and dissected. The student body then came together a few days later to rally in support of the victims of sexual abuse. Like much of the media attention that focused on Penn State, Dolak filmed the events as they unfolded. But Dolak stuck around campus after the satellite trucks pulled out to talk with the students. She captured much of the fallout and emotions that surrounded the Penn State students during those weeks and is pouring it into the documentary No Act of Ours. Though self-funded up to this point, Dolak is using the crowd-funding website Kickstarter to secure additional backing for the film, which will help pay for final production costs, including a publicist, marketing, and licensing fees. The project has a fundraising goal of $28,000 by June 15. I spoke with Dolak this week about the film and her hopes for it. Dolak's first feature, "Postcards from Tora Bora", premiered at the Tribeca Film Festival. In 2011 she produced the documentary "Our Lips Are Sealed," which is currently in festivals. Q: You were in New Jersey when the Sandusky case broke. How quickly did you decide that you wanted to film this? Dolak: Immediately. About an hour after I found out about it, I wanted to be down there. Q. There are many angles that this could be told from. What made you realize that you wanted to document the student’s point of view? Dolak: The students are thinking about this situation complexly. They were angry and wanted to protect this central father figure of Joe Paterno. To them, it was like a family member being treated badly. I think if we just sit with that and think about ‘what would we do if a member of our family was treated badly?’ we might think differently about how they reacted. I’ve talked with students who really believe that the University stands for these high standards and some of them are let down. There’s also anger from some people who feel like the University could have done more. Q. Have you met with any resistance to the film? Dolak: I have encountered resistance through postings on FaceBook. Most of the conversations have been really positive, but there is a consistent backlash from some alums who feel nervous about the project. They worry that it’s critical of Paterno or the University and it’s really not. Some people feel it’s time to move on and this film might not let us. But there are students who have told me that the media destroyed the University in 72 hours. I think it’s important to explore those feelings and give voice to what the students have to say. Q. How much of the documentary is finished? Dolak: I’ve shot more than 70 hours so far in seven months and have about six months to go. I’ll be following a student’s perspective as the trial moves forward and his experience being there. I’m also including interviews with lawyers, child sexual abuse survivors, and some professors. Q. Regarding Kickstarter, have you used crowd funding before? Dolak: I have not, but I have friends who have done Kickstarter and there have been some great successes in the film industry. I’ve backed about half a dozen projects on Kickstarter myself and it’s made me feel really good when the films have been shown in festivals and find success. You get to follow that film though that whole process, which is very cool. 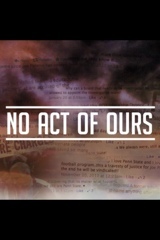 Backers of No Act of Ours fall into different pledge levels and can receive recognition, signed copies of the DVD when it’s released, and exclusive updates on the project. The generosity we've received so far is truly amazing. Q. How do you feel about everything that happened? Dolak: I enjoyed my time at Penn State and I think it’s a great school, but I never thought that bad things couldn’t happen there. No town is immune from these things but it did surprise me. It makes me sad about how so many people’s lives have been affected.